I wanted to put out a hearty congratulations to Gabrielle West, creator of Bonefire Tarot, who has just announced that her deck will soon be published by Schiffer. Very much deserved, and I commend them on their good taste. 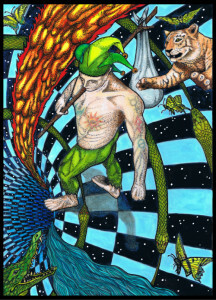 Gabi is a true artist, creating original tarot art by hand. Each card was hand drawn and painted. I respect this so much; it is so rare nowadays. The art is done in a colorful and vibrant tattoo style, and the personality of the artist shines through. She is a genuine, intelligent, kind and generous being and has done the work and put in the effort. If you don’t have her self published deck, I’d recommend getting one ASAP while she still has some left. Or wait and get the Schiffer edition which will come with a book. She has a great sense of humor and style, so I am looking forward to reading it!